Gage in position for squareness check. The angle check is a unique gage for fast, accurate checks of angles to within 5 minutes of arc on a wide variety of parts. It can also be used to check squareness without having to resort to special fixtures or multiple point comparisons. The gage's clutch mounted blade can be set at any desired angle throughout a range of 120 degrees. to establish the nominal angle using a master or sine bar. The indicator bezel is then adjusted to align zero with the indicating hand and the gage is ready to measure. 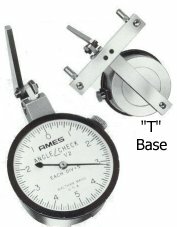 A recommended "T" base guide provides accurate, three point support of the gage and keeps it square with the surface being checked. The gage is advanced along the precision ground rail until the blade makes full contact with the measuring surface. The Model V Angle Check is so easy to set up and so versatile, it is an indispensable tool to have on hand in the shop whenever angle measuring problems suddenly arise. A selection of compact, dependable models covering a wide variety of depth gaging requirements. Each model has a hardened, ground base, 2.5" long with lock for easy positioning of counterclockwise Indicator. Zero is set with fully retracted contact flush with base. For general purpose depth gaging of holes, slots and recesses. Half inch wide base provides firm seating, stability and long wearing reference. Similar to Model 11C but has long range Indicator and two additional contacts to permit checking any depth up to 3" without mastering. Minimum Grad. .0005" .001" .0005" .0001" .001"
Total Range .075" .500" .075" .025" 1.00"
Weight 10 oz. 10 oz. 10 oz. 10 oz. 12 oz. 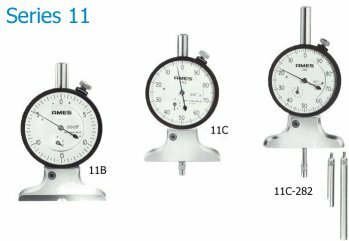 Indicators : Any English or Metric model with balanced or continuous counterclockwise dial and plain bearing, jeweled, shockless or jeweled shockless movement in AGD size 2 or 3 and with total range of up to 2". Contacts : Many lengths or shapes with 4 - 48 threads. Accessories : Tolerance hands, fitted case. Other : Special length and width bases. Push action or lever control. Long range gages with radiused or flat contacts and 9" long bases for direct measurement of all can depths up to 3/4" without readjustment. Conforms to CMI voluntary can standard. Many models to suit various make and model configurations of cans. Send print. Ames has the right gage design for you. .